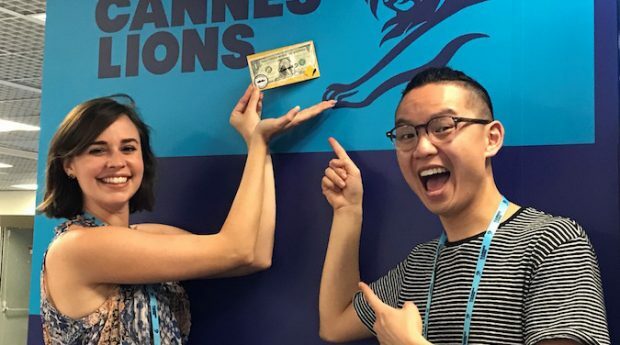 After winning the Australian Young Lions competition, Jill Harmon and Nathan Kwok have taken Bronze in the marketing category at the Young Lions competition at Cannes. Commonwealth bank’s Harmon, manager of consumer marketing strategy and Kwok, young adults marketing manager competed against 17 other nations, with each team getting 30 hours to prepare a brief for the Movember Foundation. The Gold Lion was awarded to Portugal’s Ana Rita Almeida of Worten and Diogo Vasques of Caixa Economica Montepio Geral. Silver was awarded to team India’s Raisa Chakravarty and Anupama Sharma of ITC. Kwok and Harmon recently competed in two local Young Lions competition rounds among approximately 200 total entries to be named the Australian Young Marketers heading to Cannes.